Home→Overview→09/04/15: Who Wants to Be Millennial? 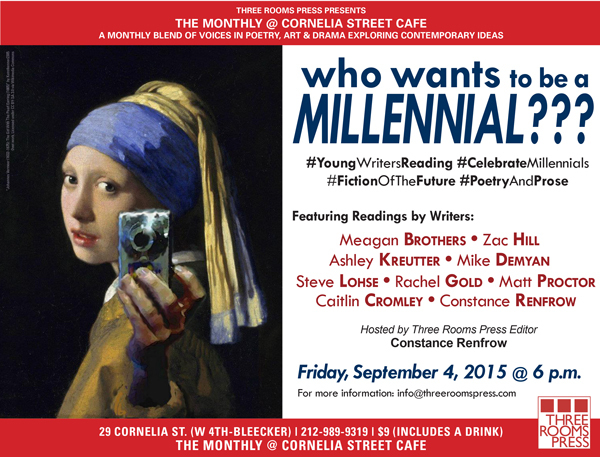 Young Writers Reading at Cornelia Street Cafe! Three Rooms Press presents a celebration of young writers and the much-maligned Millennial with WHO WANTS TO BE A MILLENNIAL? : Young Writers Reading on Friday, September 4, 2015. Doors open 5:45 p.m., showtime is 6 p.m. Admission is $9, which includes a free drink. The event features nine Millennial poets and fiction writers: Meagan Brothers (author of Weird Girl and What’s His Name, Debbie Harry Sings in French, and Supergirl Mixtapes); Zac Hill (COO of The Future Project; former Lead Game Designer, Magic: the Gathering); Mike Demyan (editor, Denim Skin); Ashley Kreutter (poet, New England College); Steve Lohse (author of “What We Talk About When We Talk About Mad-Cow Disease” [McSweeney’s, 2008]); Rachel Gold (MFA candidate at Sarah Lawrence College); Matt Proctor (poet, creator Scenes from a Life); Caitlin Cromley (poet, Drew University); and Constance Renfrow (Editor, Three Rooms Press), who will also host the event. Doors open at 5:45. Admission is $9, which includes a free drink. Cornelia Street Cafe is at 29 Cornelia Street, in the West Village, between W. 4th Street at Bleecker (http://corneliastreecafe.com/). THE MONTHLY series at Cornelia Street Cafe, hosted by Three Rooms Press, brings together writers, artists, philosophers, and scientists to delve into a different theme each month from divergent perspectives. Past themes have included conspiracy theories (on the 50th anniversary of JFK’s assassination), women in literature and science, and evenings devoted to notable rebel literary figures including Charles Bukowski and William Burroughs. Three Rooms Press is a fierce New York-based independent publisher inspired by dada, punk and passion. Founded in 1993, it serves as a leading independent publisher of cut-the-edge creative, including fiction, memoir, poetry translations, drama and art. In addition, Three Rooms Press produces and promotes a variety of literary and cultural events in New York, London, Paris, Berlin, Brussels, Los Angeles, San Francisco, and more, including readings, plays, workshops and concerts.